Avalon is one of the most popular games ever released by Microgaming; this and other games helped the company make a name for itself in the industry. If you're a Canadian fan of Avalon, then get ready for the Avalon 2 slot machine! 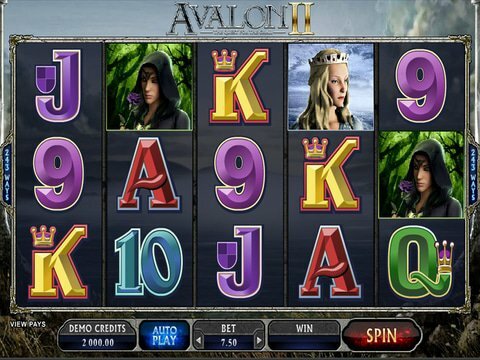 This five-reel machine with 243 ways to win is just as exciting as its predecessor, and you can review it right here on this page with the no download, no registration Avalon 2 free play slot demo available for your computer or your mobile device. You'll be on the quest for the Grail in this title, but you'll first need to decide how much you want to spend per spin. The lowest amount possible is $0.30, but it climbs to more than $100 for those who like to take bigger risks. Merlin provides instant wins and multipliers when he appears at random after spins, and the Lady of the Lake returns to act as the wild that expands on the third reel. Finally, three of the Grail icons will launch the Quest in which you get to play one of seven unique games to win big prizes like free spins, tons of wilds, or even a combination of these things. It's unique and it's a lot of fun. If you missed out on the original Avalon, then why not give it a shot? This one is a five-reel, 20-line game that is much simpler in setup, but still boasts plenty of features. The Title Logo is wild, and the Lady of the Lake is the scatter. She pays whenever you see two or more, but three or more will award you with 12 free spins during which your multiplier could climb as high as 7x! There isn't a second-screen bonus round here, but you won't miss it. It's a great introduction to one of Microgaming's most popular successes.